suspect officer has for a long time been engaged in publishing a series of articles in short story format in his facebook site, degrading the Buddha character, Yashodara Devi and Prince Rahula and that most readers of those articles have complained about it to nayaka theros of their areas. This youth writer Shakthika Sathkumara has published tri-volume of short stories as 'Siwweni parapura', 'Kalu makara' and 'Pathak katu'. This short story writer has won the national youth award as the most distinguished short story writer of the year 2010 and 2014 and has even been successful in claiming the state literary award twice of Wayamba province for his short stories twice. Shakthika who incidentally is a graduate of Sinhala special (honrs) of university of Kelaniya is a diploma-holder of mass media in university of Colombo as well. Equally so, he has even gone to the extent of acquiring a diploma in writing and mass communication at university of Sri Jayawardenepura and further happens to possess a a diploma in Buddhism from Buddhist and Pali universities. Attorney at law, Mr. Dissanayaka stated that statements which subject the Lord Buddha and Buddha character across internet is a serious that can promote religious discord and that steps were taken to to notify authorities of facebook and to prohibit the site concerned in facebook. 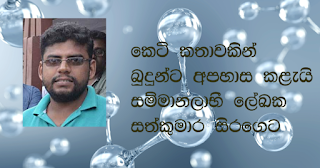 He further stated in court that complaints against this writer was lodged with Kurunegala district secretary and Polgahawela provincial secretary. The lady magistrate who took into consideration all points presented to her, ordered that the development officer be remanded. Attorney at law, Mr. Ratnayaka appeared on behalf of suspect.